This isn’t a story about Eddie Hall, Hafthór Björnsson or Brian Shaw. This, much more impressively, is the amazing story of Josh Llewellyn-Jones. Over the course of 22 hours and 10 minutes, the 31-year-old lifted over 1,000,000kg. Llewellyn-Jones has been suffering from lung problems caused by cystic fibrosis since he was young but has used exercise as a tool to overcome his condition. Over the weekend, Llewellyn-Jones set himself the gruelling challenge of lifting over one million kilograms of weight in a single day. 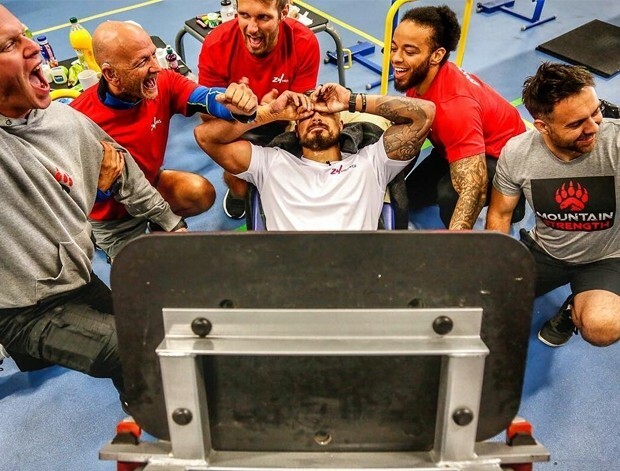 Supported by military training instructors, Llewellyn-Jones took on the challenge at MOD St Athan’s gym, which saw him falling ill several times and falling asleep during heavy lifts. He only took short breaks to eat and receive treatments for DOMS. By the time Llewellyn-Jones hit 1,000,000kg, he was 22 hours and 10 minutes into the challenge, which equates to him grinding through a hefty 700kg every minute. The idea was “a bit crazy,” he admits. But it was to inspire others to take up exercise — albeit a little less intensely. Unfortunately, cystic fibrosis remains a very real problem in Llewellyn-Jones’ life, no matter how much he exercises. Regular hospital visits from “a fair share of scares” have seen swathes of treatments, including two operations — one of which was a six-hour procedure on his intestines. “From my perspective, I’m just trying to get other children with CF into sport from a really young age to give them the best chance in later life,” he said. Llewellyn-Jones set up charity CF Warriors earlier this year to provide help and support through exercise for people with cystic fibrosis. Major respect.